Donald Trump became known worldwide for his reality show appearing on NBC’s “The Apprentice.” He has gone bankrupt four times and has managed to retrieve his fortune. The magazine “Forbes” estimates his net worth at US$ 2.9 billion. Donald Trump owns the Trump Organization, whose main source of income is the luxury hotel chain Trump Hotel Collection, with hotels in the United States, Canada and Panama. Trump spent a lot of time entering the Latin American market. The announcement of the trump Towers Rio inaugurates this new era of investment. According to Donald Trump Jr., executive vice president of Trump Organizations, who was with the mayor Eduardo Paes in Rio de Janeiro, the group intends to pursue other opportunities in the hotel market. “Brazil is a country that is emerging in the market. We want to bring the Trump brand to the ultra-luxury market. The American business person is eyeing the big events that Rio de Janeiro will host, like the World Cup in 2014 and the Olympics in 2016. The project will be builded in the harbor area. The Porto Maravilha project, where the Rio Trump Towers will be built, was inspired on a similar project in Barcelona to recover its waterfront. The Porto Maravilha project is the largest PPP (Public-Private-Partnership) in the country, involving funds of about $ 8 billion. The promise of recovery is an urban area of 5 million square meters in the center of Rio de Janeiro. The goals, according to regional development company CDURP (Companhia de Desenvolvimento Urbano da Região do Porto), is constructing 4 km of tunnels and open an express high-way on the borders of the Guanabara Bay. 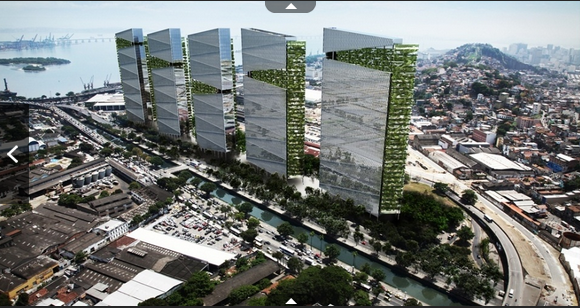 Furthermore, in 2013 near the port warehouses, a new avenue called Binário will be opened .